The weather was warm, and the sun high, as my buddy Tyler and I headed to an unfamiliar stream along the eastern shore of Maryland. Stocker territory. Our descent to the stream brought us to a slow run of water filled with hundreds of suckers. Smack dab in the middle of them all was a lone palomino, completely out of place. 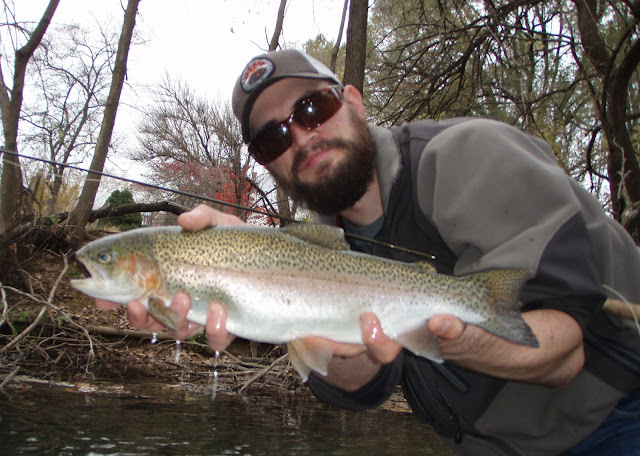 Two other rainbows and a brown rounded out the moving ball of fish. We took turns trying to entice the trout to a variety of flies. Our sight fishing efforts proved futile and we left those few trout in search of others. 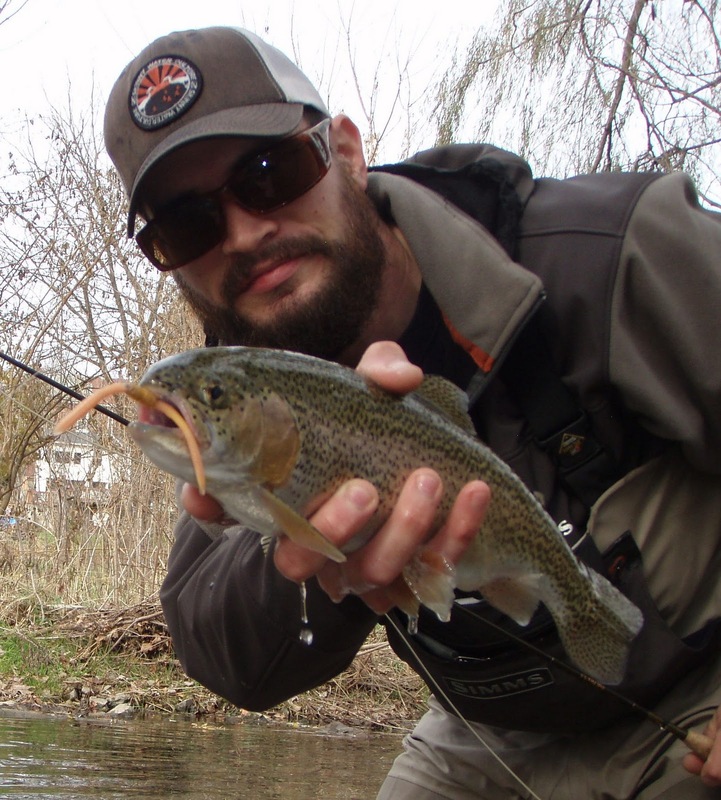 Tyler found success throwing a small olive streamer in a deep eddy, landing two small rainbows. I flailed, tossing a double nymph rig in the channel feeding the hole. On the way back, we stopped for another look at the palomino that had kicked our butts an hour earlier. I slowly changed flies, made a downstream dead drift to find success. The body language of the palomino was significantly different as he arched slowly upwards making a move on the fly. A short while longer, I gently cradled twelve inches of bright orange in my hand. My lone fish of the short sojourn was a walk off homer. Every now and then, something grabs your fly that results in the face above. The photo captured Adam at the exact moment he realized he caught something weird. Coho? 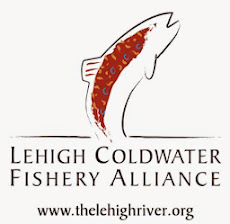 Summer run steelhead? A really beat the hell fall run fish? A much needed break was in store. Instead of driving and fishing around the clock in between work weeks, I found myself sleeping in, sandwiched between two labradors happy to see master. It took two leisurely days of rest and playing with the dogs before I picked up the fly rod again. When I did, I made a phone call, and later found myself on a small stream with the goal of slaying some stocker rainbows. On the menu are every pig rainbow's favorite morning meal: steak and eggs. 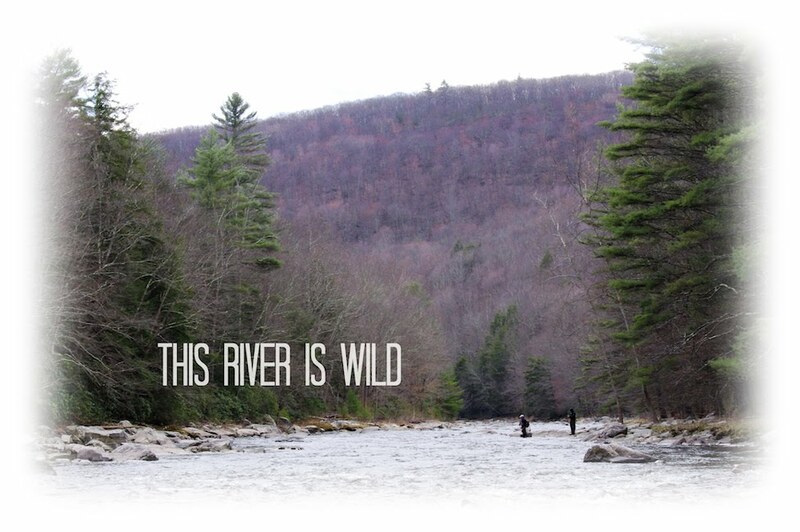 For us, its seven foot fly rods in the 2-4 wt. range with enough bend in them to execute slingshot casts between and underneath all sorts of overhangs. It is 100% pure sight fishing with egg patterns and san juan worm atrocities. Tradition is overthrown and the legends turn in their graves as hog after hog comes to hand. There are smiles on our faces and zero shame in our stomachs. The memories of a fishless weekend swinging flies endlessly for a big pull are flushed out of my system. They are replaced with small stream gluttony and football shaped overfed bows. We sat patiently on the side of the road for an extended period of time, listening to some tunes and contemplating the days strategy. We had at least a half hour before we even considered stepping into our waders and preparing our rods. We just waited. By the time you could tie a knot without a headlamp, we were on the trail, intent on reaching a piece of water we wanted to fish. We bypassed several famous pools, some great pocket water we knew and loved, and finally crossed the river to a favorite run. Along the way, we didn't see a single soul or another car. Surprised, we even joked that people forgot about changing the clocks. After awhile, I even thought that they closed this section of river. It was too good to be true. So good, that we took turns. I gave Adam the entire run and he promptly obliged by hooking a small male on a black and purple contraption. Meanwhile, the water on the rod worked its way silently into the smallest of imperfections and began freezing. The bend in the rod, courtesy of a feisty steelhead was all it took for the tip to break in half, exactly at the point we deliberated on a few hours earlier. Our perfect morning suddenly began fading as a broken rod gave way to a series of misfortunes that left us shaking our heads. Missed fish were only the beginning. 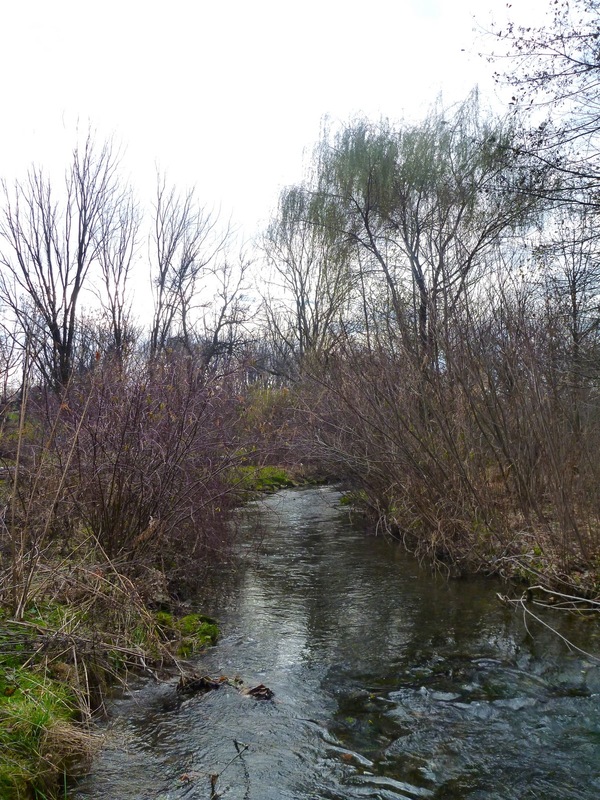 All the water we bypassed began filling up faster than Salmon season and the fishing was hot. Before we could partake in some fun, the sun was high in the sky, and the fishing cooled down. We were left to dwell on a shipping bill and a few weeks without any tributary swinging. In between sips of red bull, I remembered watching the temperature plummet as we drove north towards the closest steelhead. Arriving, I stepped out of the Jeep and into a frozen landscape completely different than the one I had left six hours earlier. It was pitch black without a cloud in the sky as I placed my waders on. My hands unfamiliar to the chilly air, ached as I laced up. I yearned for a handwarmer. Soon, Adam and I made our way riverside down a well worn trail that thousands of anglers march upon each season. We rigged up under headlamps and the glow of Orion's belt finishing with enough time to watch the first light peak over the horizon and shoot through the trees. The morning fog hovered precariously on the water for the first hour of light. The best time to catch a steelhead on the swing. The run we found ourselves on was slowly moving and had a depth of 4-5 feet. Downed trees lined the far bank providing cover for the fish. My chance came first. I casted slightly upstream allowing my unweighted prom dress to descend in the water column. With a downstream mend, I raced it across the pool and infront of a snag of trees in the water. The pull came immediately. I clamped down on my running line and raised the rod hoping to tie into a nice fish. The running line had other ideas. It slipped through my numb fingers and the hook set failed miserably. A simple headshake by the fish and an eruption of water ensued as my only chance of the day glided back to the snag. Downstream, I heard a whole lot of commotion as Adam lets out a series of expletives celebrating a fish. The elation soon turned to horror. The steelhead on the end of the line looked like it went through hell. Slightly emaciated, with a bronze color, the fish looked like it had been hooked thirty times over. It didn't even look like a steelhead, even though it was. 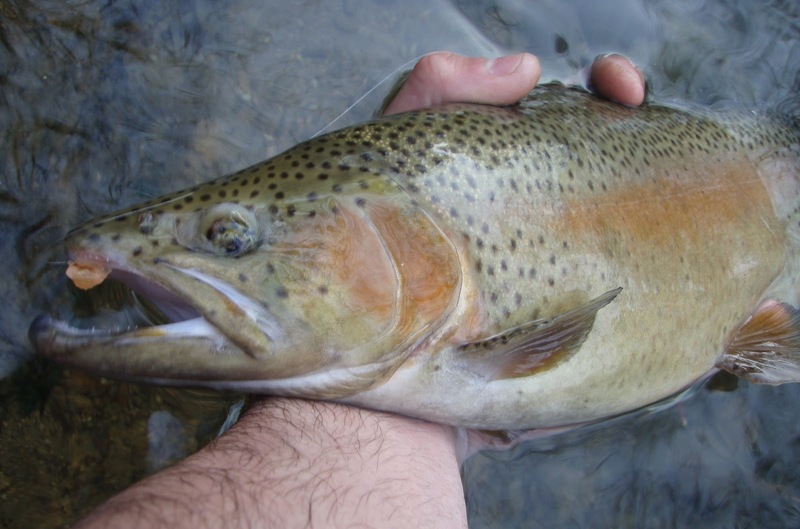 The fish was released back into the river, where hopefully it recoups or some other angler puts it out of its misery. Soon, the first drift boats rolled into the run, parked directly across from us, and began hooking up left and right. The first hour of light came to a close and the chances of bringing up a fish on the swing diminished greatly. 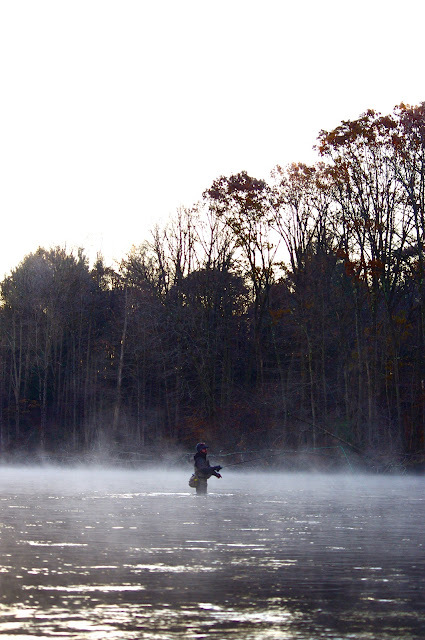 Along with our chances, the mist and fog receded as the sun came upon the water providing relief to our frozen hands. The rest of the day was spent fighting crowds of anglers, more crowds than salmon season. Looking back, the best part was the beginning, swinging in the mist. The crowds of Salmon season have dissipated leaving behind open runs downriver. Adam and I took advantage of the opportunity and headed north intent on steelhead on the swing. We had extremely high hopes thanks to some hot reports and blinding pictures of chrome slabs. We even spent a whole week tying new concoctions in all varieties. We thought we had assembled a fleet of destroyers but the steelhead had other things on their palate. Like eggs. The night on the road went by in a breeze with intermittent showers and the promise of rain all day long. This only heightened our expectations into a fever pitch. With new skagit lines on our rods, we couldn't wait to get on the river to dial in our casting strokes and entice a few willing fish. It was a whole lot of hope dangling on a string. 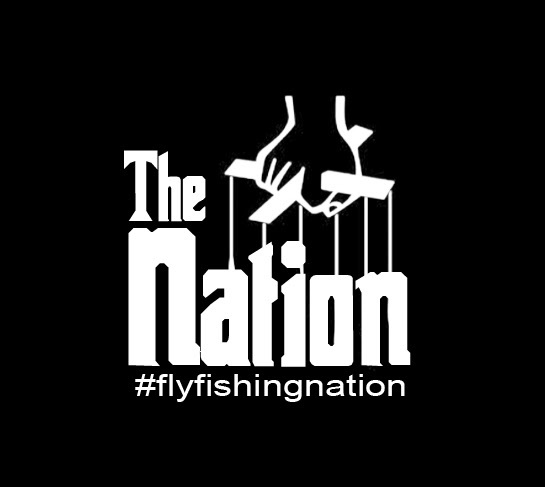 We were blanked, skunked, and demoralized left shaking our heads, as trembling hands tied on another fly in vain. With our confidence rocked, we were left with a major dilemma. Our thoughts slowly crept to sharkskin lines on spare reels, to large thingamabobbers, and freshly tied egg patterns veiled in all sorts of awesomeness. Although we both didn't speak about it, we could tell what was on each other's minds. All day long, the thought of a dead drift, a suddenly dipping strike indicator, and jumping chrome tempted our minds and tested our resolve. Adam and I played a game of chicken. Who would be the first to crack under the pressure of catching a fish? As the hours ticked by and the light faded on the horizon, neither of us blinked. Our morals held strong in the aftermath of one of those weekends, one of those days, where we didn't give into temptation. It was swing or go home.